Christopher Kane had a decent year in 2009, collecting a BFA for the Collection of the Year in 2009, and launching arguably the best high street collaboration of the year with Topshop. Apparently, that was just the prelude to an even better 2010. His autumn winter collection, which showed at the Topshop venue in Covent Garden to a star-studded audience, is nothing short of breathtaking. Don't know about you, but I didn't know bright coloured embroidery could be gothic, A-lines dramatic, or baby-doll dresses dark and powerful, for that matter. All on a black but never blank canvas, embroidered gothic LBDs came in all shapes - kimono, baby-doll, smocked, classic, shirt, bodycon, shift, you name it. Tops were just as unorthodox, including a black lace blouse, a slim leather shirt, see-through jumpers of organza and others with cape-like sleeves, bearing the lush embroidery, paired with A-line minis or patent leather skirts. 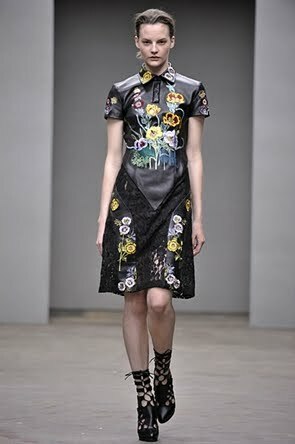 An even sharper line of outfits came in leather, patent leather and lace, with metal and stone embellishments all over. The verdict is clear: Christopher Kane, ladies, is not a victim of his own success. His real signature is his talent that just won't be confined to any particular style or approach. Every season, he starts everything from scratch, bar the embellishment - and quite frankly, we can't thank him enough for that.